Budongo Mahogany is a deciduous tree which can grow up to 55m tall. It is found widely across Africa in lowland and lower montane forests. 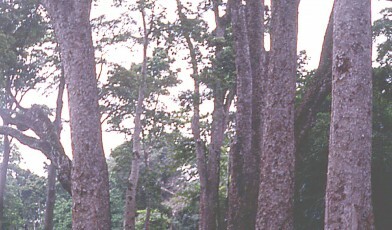 This tree is part of the Mahogany family and is exploited for timber which is used in joinery and furniture making as well as flooring and ship building. It has been listed as vulnerable by the IUCN because of overharvesting for timber which has focused particularly on mature individuals. This has also contributed to a reduction in the genetic diversity of the species, leaving it potentially vulnerable to diseases or climate change. There are some restrictions in place to protect these trees in various countries but there is still concern as it is a commercially important species. This is a slow growing species and does not regenerate well at large distances from parent trees. However it is able to regenerate easily after logging damage, although not following a fire. Entandrophragma angolense is also used in traditional medicine with various parts of the tree being used to treat fever as well as stomach ulcers, kidney pains and earache. It can also be used to treat malaria. This medicinal usage also presents a threat to this species.